Dr. Janice Lester and Capt. James Kirk exchange minds in the Star Trek episode 'Turnabout Intruder'. A mind transfer is the hypothetical transfer of a human mind either into a computer or other non-human receptacle, or from one human body to another; also referred to as mind uploading or mind downloading. Transference to a computer would result in a form of artificial intelligence sometimes called an infomorph, while transference to an artificial body would result in a cybernetic organism, or cyborg. Even if mind transfer proves to be possible in theory, the technology needed to bring it about is not yet on the horizon. Uploading consciousness into bodies created by robotic means is a goal of some in the artificial intelligence community. In this scenario, the consciousness is assumed to be recorded and/or transferred to a new robotic brain, which generates responses indistinguishable from the original organic brain. However, it is not known how much computer memory or processing capacity, or what kind of architecture, would be needed to simulate the activity of a human mind inside a computer. 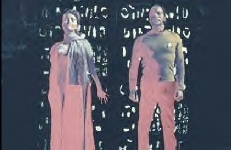 Mind transfer or uploading is a common theme in science fiction. Greg Egan has explored many of the philosophical, ethical, legal, and identity aspects of mind transfer. In his "jewelhead" stories, the mind is copied from the organic brain to a small, indestructible computer at the base of the skull before the organic brain is surgically removed. In Star Trek : The Original Series (series three, episode 79: "Turnabout Intruder"), an alien device is used by Dr. Janice Lester to forcibly swap minds with Captain Kirk. However, Spock sees through the deception during a mind-meld with Kirk, trapped in Dr. Lester's body. The concept of mind transfer is similar to that of teleportation in that it raises profound philosophical questions about the nature of human identity, individuality, and the soul. Compare also with mind-meld.